In early 2019, the City approved a lease agreement between the Department of Elections and Dominion Voting Systems for the use of Dominion’s voting system to conduct elections in San Francisco. This means that San Francisco voters will begin using the new voting system in the November 5, 2019, Consolidated Municipal Election. The new voting system, Democracy Suite, has several advantages over the previous system. The new system features a more intuitive method for marking the ballots, allows voters to rank a greater number of candidates in contests that use ranked-choice voting, and provides simpler ballot navigation for voters with disabilities. The new voting system also enhances election transparency and security by using ballot scanning equipment to create annotated images of voted ballots for public viewing and verifying election results. We invite you to explore this page to learn more about the new voting system and to provide your input on the Department of Elections’ planned outreach efforts to inform the public about the changes! Voters will continue to use paper ballots to cast their votes. However, voters will fill in ovals next to their selections, instead of connecting arrows. Using an efficient grid layout for ranked-choice voting contests, the new system allows voters to rank up to a maximum of 10 candidates, instead of the limit of three candidates that the previous voting system allowed. The new accessible ballot-marking device offers better audio and touchscreen interfaces, and is compatible with a number of assistive devices. Digital images of voted ballots and records of how the equipment interpreted vote-marks will be posted online. Members of the public can download and tally these images to independently verify election results. No part of the new voting system connects to the internet at any time or electronically receives or transmits election data through any type of external communication network. The new voting system offers a more intuitive way to mark paper ballots. In recent elections, voters have connected arrows pointing to their choices on the ballots. Now, voters will fill in ovals to indicate their selections. Ranked-choice voting allows voters to rank candidates in order of preference and eliminates the need to conduct runoff elections. Since 2004, when the Department of Elections implemented ranked-choice voting, the City’s voting systems could allow voters to rank up to three candidates. The new voting system allows voters to rank up to a maximum of 10 candidates in a ranked-choice contest. The new ballot format for ranked-choice voting contests is a grid, with the names of candidates listed in the left column and rankings in the top row. Voters can rank all available candidates in a given contest – up to a maximum of 10 candidates – using the columns on the ballot to indicate their choices. To vote for a qualified write-in candidate who is not listed on the ballot, voters can write the person's name in the space at the end of the candidate list and fill in the oval for the rank. To learn more about ranked-choice voting, visit the Ranked-Choice Voting page. The new accessible ballot-marking device offers better audio and touchscreen navigation and is compatible with several assistive devices. The new device also allows voters to view or hear voting instructions while marking their ballots. After marking and printing, a voter’s selections are cleared from the marking device and the printed ballot can be scanned with the same tabulating equipment used for standard paper ballots. In recent elections, the City has used optical scanning machines to read and tabulate votes on paper ballots. All voters will continue to use paper ballots with the new voting system. The new ballot-scanning machine counts votes and captures images of the marked ballots. These ballot images, which include records indicating how the votes were interpreted by the equipment, will be posted online. Interested members of the public will be able to view, sort, and independently verify election results. The new voting system incorporates the most recent security standards from the California Secretary of State’s Office (SOS) and has been certified for use in California by the SOS. The SOS applies one of the most rigorous voting system testing and certification programs in the country. Prior to being certified for use, all new voting systems undergo end-to-end testing, including functional testing, source code review, red team security testing with experts trying to “break into” the voting system, and accessibility and volume testing. In compliance with SOS certification standards, no part of the new voting system connects to the internet at any time or electronically receives or transmits election data through any type of external communication network. The system encrypts data and requires successful completion of a two-step authentication process before anyone can access data. Prior to each election, the Department of Elections conducts Logic and Accuracy testing of every piece of voting equipment that will be used in the election. During the testing, ballot cards are marked in a pattern to produce specific results for each contest. The ballot cards are then processed and the results are compared to the expected results to verify that the system is functioning mechanically (ballots are fed correctly through belts and rollers without jamming), logically (the unit recognizes the specific election’s ballot), and accurately (the voting equipment reads and reports the correct number of votes expected). The new voting system facilitates post-election risk-limiting auditing (RLA). RLA provides an additional method for verifying that a voting system properly recorded and tallied votes and accurately reported outcomes. For more information about the SOS testing and certification process, visit the Voting Technology page. For more information about SOS cybersecurity measures, visit the Election Cybersecurity page. 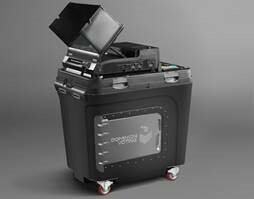 Every polling place will have an ImageCast Evolution Ballot-Scanning Machine, that scans and tallies voted ballots.The ballots are then deposited into a sealed ballot box. The tabulated votes and scanned ballot images are stored on a memory card. After the polls close on election night, the memory card is removed and transported back to the Department of Elections. The results from each polling place’s memory card are then uploaded into the total count. An ImageCast X Ballot-Marking Device will also be provided at every polling place on Election Day and at the City Hall Voting Center during the 29-day early voting period. The accessible ballot-marking device features audio and touchscreen interfaces and is compatible with a number of assistive devices, including a Braille-embossed handheld keypad (audio-tactile interface), sip-and-puff systems, paddles, and head-pointers. The ballot-marking device allows voters to change text and background colors, choose from a broader range of font sizes, and adjust the reading speed of audio ballots. Voters can choose a ballot in English, Chinese (Cantonese or Mandarin audio), Spanish, or Filipino. Voters using the ballot-marking device have the option to view or hear a summary of their choices and change any selections before printing their ballots. The ballot-marking device only marks a ballot; it does not count votes. 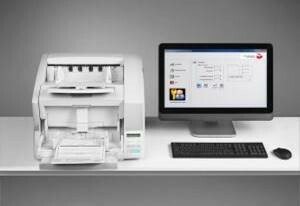 The device generates and prints a paper ballot with the voter’s selections. The ballot is then scanned through the ImageCast Evolution Ballot-Scanning Machine at the polling place for tabulation. 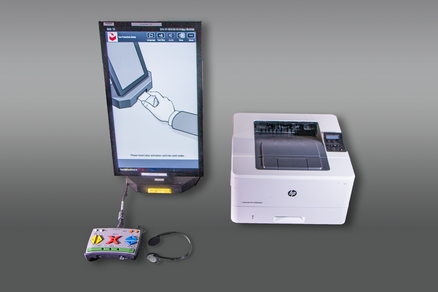 An ImageCast Central Count Scanner is a digital scanner used to tabulate vote-by-mail ballots, provisional ballots, and ballots cast at the City Hall Voting Center. This machine scans a full digital image of the paper ballot and the voter’s marks and counts the votes electronically.